Pol Pot was the Communist dictator of Cambodia responsible for the “Killing Fields.” From 1975 to 1979, “Number One Brother” (as he was known) was responsible for the deaths of 20% of the population of Cambodia. Number One Brother died in 1998, but Number Two Brother — a man named Nuon Chea — was alive in the mid-oughts, being visited by an independent filmmaker named Thet Sambath trying to preserve history on video. Enemies of the People is the result of Thet’s persistence and patience. Over the course of three years, Thet visits Nuon Chea, seemingly every weekend, spending time talking with and videotaping the former dictator. Nuon Chea is reclusive, living in a rough, modest house with his wife. Thet tries to get Nuon Chea to talk about the era from 1975 - 1979 when the killing took place, but he doesn’t press. He waits. And waits. In the interim, Thet interviews people who admit to carrying out some of the killing. He visits a tranquil spot under a shade tree, a dike nearby holds lots of water for the lush agriculture. One of his subjects begins to open up about how it all went down, and where the bodies are buried now (just on the other side of the path, he says). An old woman happens past, noting the camera, and she too is happy to discuss where the bodies all are. Thet seems to have a personality that invites people to open up. Thet goes on-camera to discuss his methods. He says people are usually reluctant to admit to killing, but that if he patient and seems genuinely interested, they eventually come around. Sure enough, he finds another foot soldier who initially denies having killed anyone in the late 70s. But Thet and his friend start asking about details, suggesting how it might have happened, and soon the reluctant subject is correcting their mistakes with the facts as he remembers them. Thet frequently visits Nuon Chea over the course of three years. Finally, when the United Nations starts making noises about possibly coming to arrest Nuon Chea for war crimes, Thet realizes that he has to press his luck now or he may lose the chance. 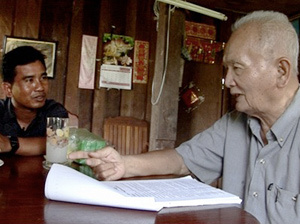 He brings Koun and Soun, two of the foot soldiers he had interviewed, and he tells Nuon Chea that his own parents were killed in the 1970s under the Khmer Rouge. Finally, Nuon Chea begins to tell his story on camera. Enemies of the People is rough around the edges. The footage isn’t uniformly well shot. The pacing feels slow; you’re not sure if the film is really going anywhere. But somehow the more you think about Enemies of the People the hard it is to dismiss. For starters, I was interested to see a documentary made by a local. Quite often, documentaries at festivals are the labors of well-meaning white people who travel to the countries of impoverished brown people to document their squalor and hardships. Enemies of the People is indeed about the mass murder of millions of second-world citizens, but it’s the work of a dedicated local civilian, and not an outsider looking in. And the dedication of Thet Sambath is undeniable. His wife goes on camera and says she wishes her husband would focus on family and work rather than chasing this obsession of his. Thet reveals scores, if not hundreds, of mini-DV tapes of interview footage from untold visits with Nuon Chea. Then there’s Thet’s personality. He has the same nervous grin that I have, and I’ve never considered it much of an asset. Yet somehow his genuine curiosity encourages people to open up. Then there is Thet’s motivation. Thet says he’s interested in finding out why his parents (and millions of others) had to be killed under the Khmer Rouge. But there seems to be a deeper drive, an obsession. Thet works for a TV station, but he tells Nuon Chea that he is working on behalf of history, not journalism. The idea that there is a difference — and that it’s important enough to dedicate your life to — is worth a long ponder. And finally there’s a very subtle yet very powerful technique that Thet and codirector Rob Lemkin use in editing the film. When speaking with Nuon Chea, especially during the climactic interview, we see the footage as Thet watches it on his editing suite. We aren’t watching the footage directly from the camera, in the present tense. We are seeing it as it is being reviewed, as something that already happened. The idea of a present and past tense in documentary film is mind-blowing. Thet and Lemkin may not have even intended such a thing. But the emotional impact is surprising. When Thet reviews the footage of Nuon Chea, it is the first time the audience sees it. It’s all new to us. But we’re no longer behind the camera, watching it as it happens. We’re reviewing the footage, already trying to digest what it means. We are out of the realm of today, of journalism, and into the realm of yesterday, of history. Maybe Thet used the grammar of film to keep his promise to Nuon Chea, that he would record his tale for history and not journalism.